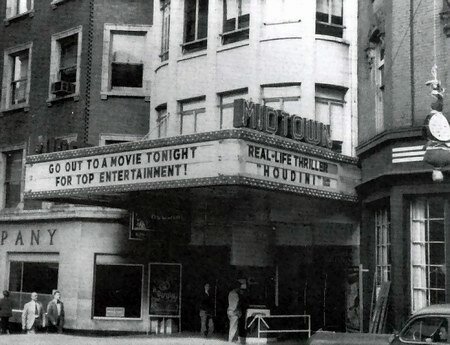 I probably saw more movies at the Midtown than any other theater in Grand Rapids. John D. Loeks, the owner, like policemen and usually kept my father well supplied with passes. I liked Mr. Loeks a lot. Tearing down this fine building to build a parking lot was a criminal offense. 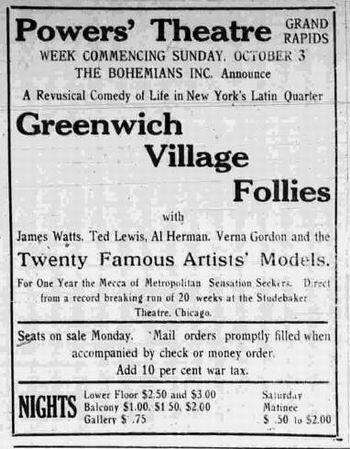 The Powers Theater was were so many fine actors got their start. Think Spencer Tracy, for example. Another part of this building was Chinnock's Recreation, a wonderful joint. It was a pool hall and excellent restaurant. I am the 3G Grandnephew of William Thompson Powers who built the Powers' Opera House in 1873-74. I am doing extensive research on the history of the Powers Midtown Theatre. If there's anyone who wants to share their memory, story or photo of the Powers and Midtown Theatre please contact me through my blog: PowersBehindGR at wordpress. com powers-theatre I look forward to talking with you. Jim. My father was working in the McKay Tower during the 70''s, and I can remember visiting his office and seeing the Midtown, and adjacent Consumer''s Power buildings being torn down. I remember one of dad''s co-workers was disappointed not because of the loss of the buildings, but the loss of his parking space; he used to park his motorcycle under the marquee. I worked in the Midtown Theatre in the early 70''s and it was amazingly beautiful. It also had doors that went from it right into the People''s Building which was next door. There were old cat walks with dressing rooms on each landing with tiny sinks with tons of messages written from old actors who had played roles with dates from 1934 (that I remember). The other great thing about this theatre was the foot lights still worked and tin the basement you could access the underground tunnels that went down streets and all over! We used to close the theatre at night and then the fun would begin as we explored these tunnels. The building itself was stunning with gold carved woodwork and marble stairs and bathrooms. The curtains alone were a magnificent dark red velvet and when you turned the foot lights on and stood on stage it felt as though you had stepped back in time to the old vaudeville theatre it had once been. The stage also had a trap door for magicians that went right into the basement!One thing most people don''t know about was the third balcony that had been closed off when it was converted from a theatre to a as a secret. These were indeed the cheap seats as they were very high and straight backed with none of the architectural specialties of the rest of the facility. I felt terrible when they tore this down and made it an Ellis parking lot. It was a beautiful theatre with rich history. This was a beautiful theater inside. I think the closing date was around 1975 or 1976 as I remember seeing movies at this time when we first moved to Grand Rapids. I do remember before it was torn down that it was to become the Civic theater and the Majestic torn down to make a parking lot, but it seemed at the last minute the Civic took the Majestic as theyre home. Perhaps the Midtown made a more convenient location for a parking lot. What a stunningly beautiful theatre this was, and what a magnificent history! It was built in 1873 as the Powers Grand Opera House and continued in business all through the years, becoming a Butterfield house in the teens, and then a movie theatre. 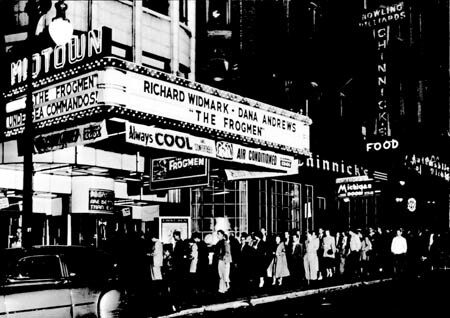 Loeks Theatres operated it in the forties as the Photo News, and then it was named the Midtown Theatre. Loeks had it completely renovated and restored. I went there in 1972 and was amazed at the sheer beauty of the place, still retaining its opera house flavor. It closed in 1973, I think, due to diminished revenues, like so many others. I just could not believe it when it was torn down. But it wasnt alone. The Kent, Center, Savoy, and others went due to downtown redevelopment. Happily the Majestic remains, although I dont know what it looks like inside; hopefully the opera house look it had remains.